The Dotty Hippo Blog: Do You Know the Law Regarding Child Car Seats and Boosters? Do You Know the Law Regarding Child Car Seats and Boosters? On the 15th April 2015 the legislation regarding child car seats and boosters has been revised. The full version of the legislation may be found on the website here however for a quick and easy to read reference we've broken it down for you. How Long Must My Child Use a Car Seat or Booster? The law as it stands today states that *all children should be using a suitable car seat or booster seat until they reach twelve years old or a minimum of 1m 35cm (135cm) in height. *Children with disabilities are expected to adhere to this legislation unless they have a doctor-issued medical exemption. In the event of this exemption being in place a suitable alternative harness or similar restraint may be used. Buying a Suitable Car Seat To ensure that you adhere fully to the legislation it is important to check that your car seat or booster qualifies as an EU-approved seat. If you aren't sure about whether yours is or isn't, or are shopping for a new one have a look at the label. EU-approved car sets should sport a logo which is an E within a circle. Weights over 22kg - Children must be seated on a suitable booster cushion. 1. Children under fifteen months old should be in a suitable (EU-approved) car seat that is rear-facing. 2. Children over fifteen months old should be in a suitable (EU-approved) car seat that is forward facing. It is important that regardless of what type of car seat you choose that you find one that is suitable for the height / age and weight of your child. Remember to only buy a EU-approved car seat and that buying a second-hand car seat is not recommended as even the slightest of bumps may cause unseen damage which reduces the effectiveness of the protection it offers. In some situations, such as traveling in a taxi a child does not necessarily need to be seated in a car seat. More information on this may be found here. Don't forget to review the legislation so that you know exactly what the legal position is. There are a number of accessories that have been cleverly designed to ensure that your children are safe and comfortable when traveling, therefore happy. While these accessories are not a legal requirement unlike car seats they are worth investigating. 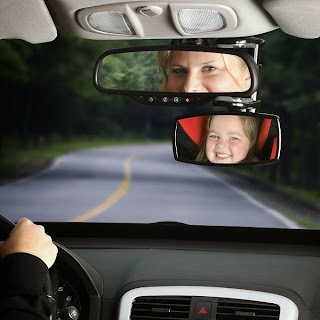 A specially placed mirror for example such as the Diono See Me Too Mirror allows you and your child to see each other, reassuring you and them. This handy tool also eliminates the need to turn around to check on your children. When you are planning a trip please do ensure that your car seat/s are in good repair and properly fitted so that you may enjoy a family day out that is memorable for all of the right reasons.